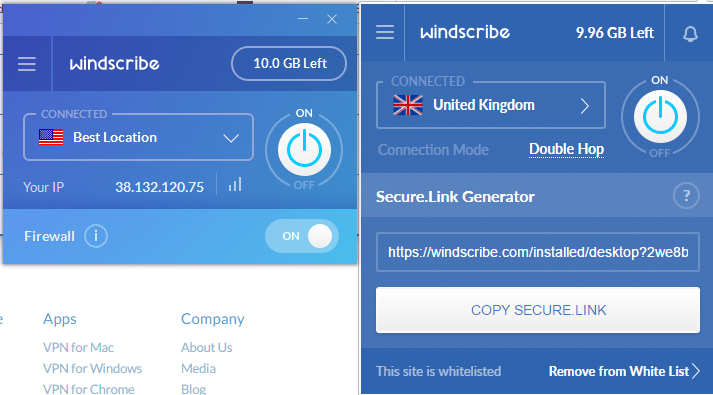 The free Windscribe VPN works in exactly the same way as the paid version. However, the free version has a data throughput limit of 10 GB per month and only has access to servers in eight locations out of the 45 server countries available to paying customers. The full list of server locations has a good selection that includes India, Australia, New Zealand, and South Africa. Unfortunately, none of those locations are available on the free version of the VPN, so if you are from one of those countries and want to check into geo-restricted content back home, the free VPN won’t be much use to you. If you decide to chance it anyway and subscribe, you have just three days to try the service and still get your money back if you find that it doesn’t get you into the sites you need. 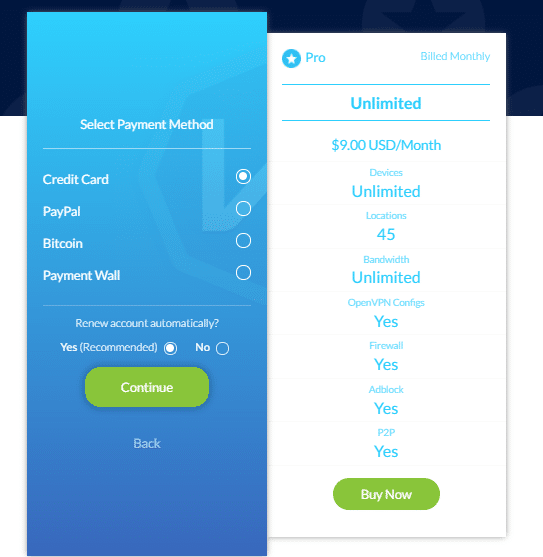 The price of $7.50 per month (when paid upfront on a one-year plan) marks this VPN service out as one of the more expensive in the industry. Thankfully, it also offers a free version. Although you are only allowed to have one device connected at any one time with the free service, that doesn’t mean that you can only install the software on one device. You can have the VPN software on your computer at home, but make sure you turn it off before you go out if you want to use it on your phone while you’re out and about. The paid service’s unlimited number of simultaneous connections seems like a phenomenal offer. Unfortunately, the company specifically forbids account sharing. This is a shame, because cheaper services such as NordVPN and VPN Area encourage account sharing with their multiple connection allowance. 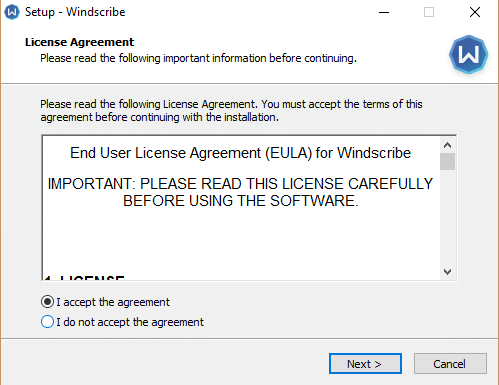 If Windscribe could just adjust this policy, it would make its service more accessible to a wider market. Along with credit and debit cards, the company accepts Bitcoin and payment through PayPal. Paymentwall enables customers to pay with a very large selection of payment methods. These include Alipay, UnionPay, QIWI, and Yandex Money. When you want to upgrade to a Pro account, you need to click on the “Buy Now” button beneath the yearly or monthly options. The chosen card flips around in a very elegant piece of animation and reveals your payment options. Be careful about that automatic renewal radio button at the bottom of the form, because that means they will keep taking money out of your account long after you have forgotten that you signed up for the service. Without you realizing it, the websites that you visit are able to collect a large amount of data about you. They can see the previous website you visited and, when you move on to another site, they can see that, too. If you have a profile set up in your browser, the programmers of a webpage can even capture your name and your email address. Have you ever noticed that you search for a product or a possible purchase at one site, and then an advert for it appears on just about every webpage that you visit subsequently? This is a method called “retargeting” and it employs a combination of tracking and targeted advertising. Windscribe blocks the delivery of adverts from external content servers, which puts a stop to advertisers stalking you. The ad blocker feature is part of the security measures available in the browser extension. 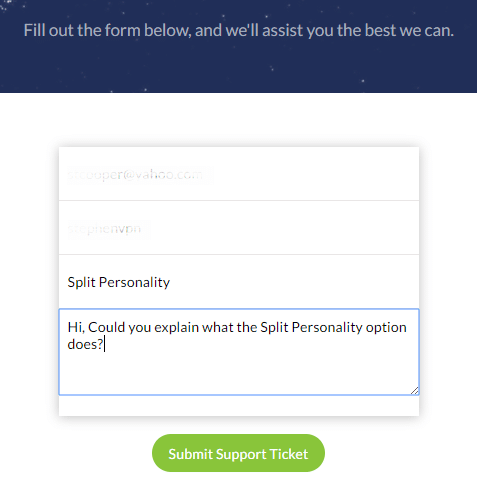 Split Personality is another privacy option that is available in the browser extension. This jumbles up user agent data in an attempt to foil sites that create a fingerprint to identify masked visitors. These user agents include the type and version of your browser and also details about your computer, including the type of processor and the screen resolution. When you connect to a VPN, your communications with websites are identified by a temporary IP address, which changes every time you log on. The fingerprinting technique used by some sites means that they can still identify you. Split Personality sends fake information about your user agents. When you click on the Rotate button in the Privacy Options of the browser extension, the program will generate different fake user agent data, so you can’t be identified as someone who visits the site regularly. Secure.Link performs two functions. Firstly, it is a URL shortening service. Thus if you want to email the address of a webpage to someone, you don’t have to include all of those endless parameters that a lot of sites put on the end of their query results pages. As well as creating a temporary short address, the function scans the target page for security weaknesses and tracking codes. When you enter the Secure.Link address in your browser, you’ll see the report and have the option of progressing to the original page. The copy that you see will have all of the security and tracking risks disabled. You can see an example of this report page in the Using Windscribe Browser Extension section of this review. Windscribe only implements OpenVPN. Most VPN services offer alternative VPN protocols, such as Point-to-Point Tunneling Protocol (PPTP) or Layer 2 Tunneling Protocol (L2TP). However, these usually have to be set up manually and most users prefer to stick with the app-based service that is provided for OpenVPN implementations. The iOS operating system is tricky for third party developers to manage, so getting a VPN app that works on those Apple devices is difficult. 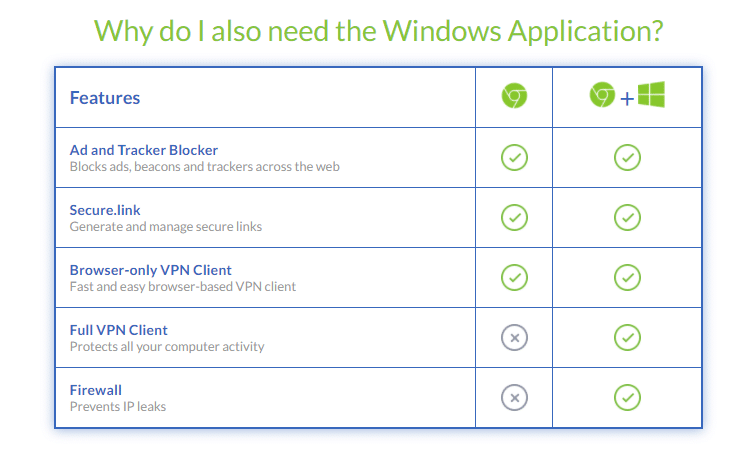 Windscribe offers an app for iOS, but it recommends that iPhone and iPad users install the OpenVPN Connect application instead. This app is provided free of charge by the not-for-profit organization that manages OpenVPN. 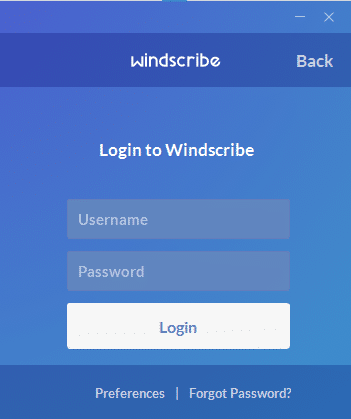 You can download it directly from the Windscribe website. The company uses Advance Encryption Standard (AES) encryption with a 256-bit key, which is the industry standard. Session establishment and key exchange are protected by 4096-bit key RSA encryption. The strong RSA key makes this one of the most secure VPN services around. The Windscribe site explains that it deletes all connection data three minutes after a user session ends. With the paid service, it is easy to see how the company could operate without records of user activities because there is no limit on usage. The subscription model is time-based, so the company just has to deactivate an account once the subscription period ends. 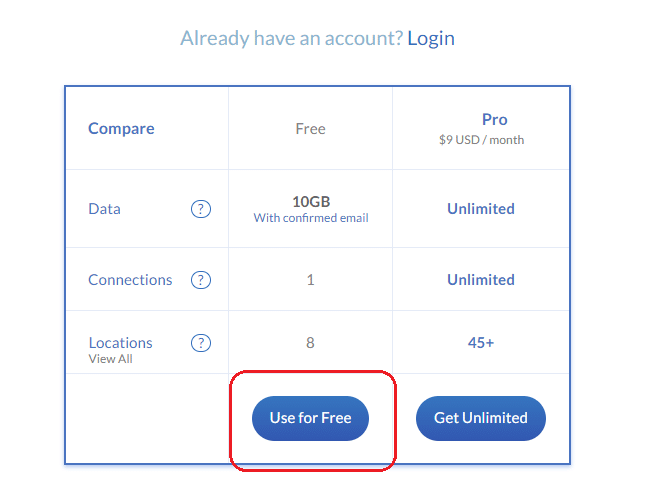 With the free version, the company has to keep records on each account’s level of usage, because those free accounts are subject to data throughput limits. However, you don’t need to give any personal details in order to set up a free account, so that should ensure that you are untraceable. The list of server locations for the free version is very short, compared to all of the servers available to subscribers. Whether you just want the free VPN or intend to subscribe to the paid service, you begin at the same starting point: setting up an account. Click on the “Sign Up” button at the top of the company website’s homepage. 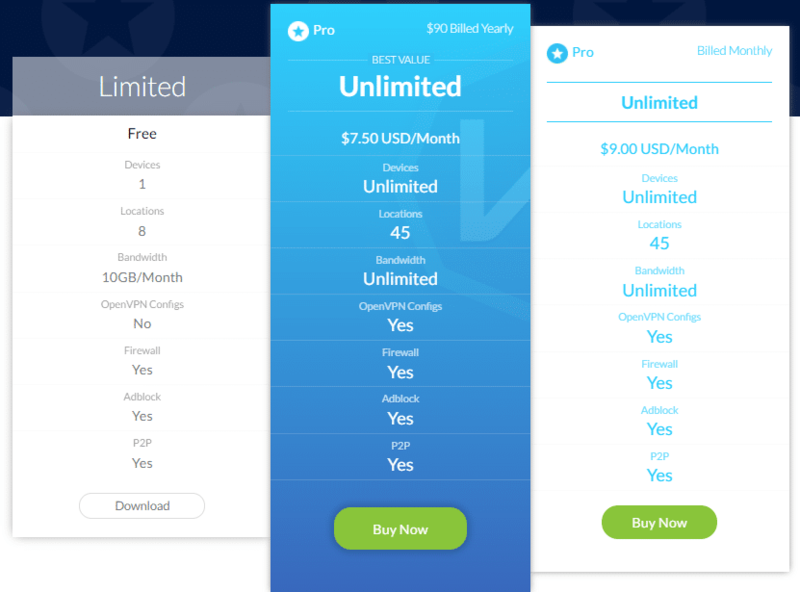 The next screen is a comparison page that explains the difference between the free version and a subscription. The company gives a very limited refund period of three days. Thus it is better to take the free account first and then upgrade once you are comfortable with the VPN’s utilities. Click on the “Use for Free” button. The next screen allows you to set up a username and password. You will notice that you don’t have to give your name or email address. This helps your privacy, because your activity cannot be traced to your identity. However, the VPN will always be able to see your IP address. Your option to not enter an email address will cost you. This is because the company springs a surprise on its free users at this point. If you don’t enter an email address, you only get a data throughput allowance of 2 GB per month instead of the headline 10 GB. You can get around this restriction by setting up a webmail account that you don’t use for your regular activities and entering that address in the Sign Up screen. 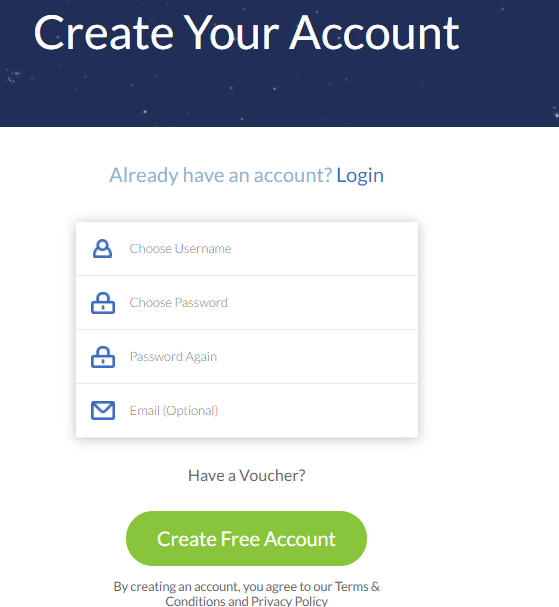 After filling out these details, you need to click on the “Create Free Account” button. You can’t get away with entering a fake email address because you need to open up a confirmation email in order to get the 10 GB allowance. 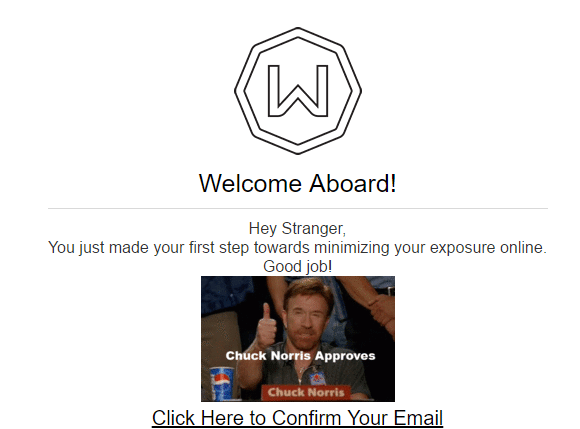 Click on the link in the email to avoid getting on the bad side of Chuck Norris. After creating your account you will be taken straight to the user area of the website. A program in the page detects your operating system and browser type. You will be presented with appropriate download links. You will notice that there is a Download button in the top menu of the website. You don’t actually have to sign up in order to get the download file. However, you will need to sign up subsequently in order to get the app to work. The app installs files after you click on the button for your operating system. Click on that downloaded file to open up the installer. The installer is multi-lingual, so select your language from the drop-down list in the pop-up that appears on your screen. The company advises users to install both the app and the browser extension for maximum protection. The app has a stronger VPN built into it than the browser extension. However, the extension includes tracker and ad blocking facilities. The configuration of the service allows you to have both the extension and the app active at the same time. You can use this concurrent service to create a double VPN by selecting different servers in each implementation. To install the extension, you need to go back to the client area of the website. Click on the version for your browser, which has already been selected for you. In my case, using Google Chrome, this action took me to the Google Chrome Webstore. Add the extension to your browser by clicking on the “Add to Chrome” button. You can also install the extension on Firefox and Opera. In order to do this, open the browser and go back to the website. The site will present you with a button to install the extension for that browser type. Unfortunately, there are no add-ons for Microsoft Internet Explorer or Microsoft Edge. When the installation is complete, you will see a gray “W” icon at the end of the address field of your browser. The first time you open the extension, it will prompt you for the login credentials that you created when you signed up to the service. The VPN protection will kick in immediately. This means that you have no idea which of the eight VPN servers you are connected to. 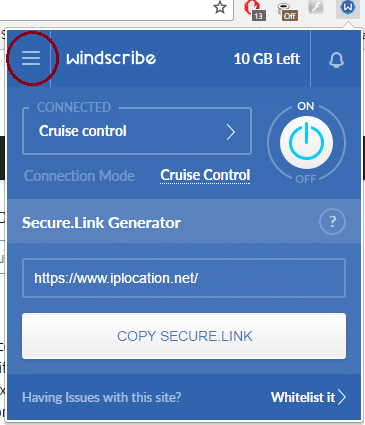 The Windscribe browser extension has a setting called “Cruise Control,” which other VPNs call automatic server selection. Although this “best fit” server selection gives you instant protection, it is no good for targeting geo-location locks in specific sites. If you want to get into a site that only allows access to people in the same country, you need to have control over which country you appear to be in. If you find yourself in a situation where you know that your internet traffc is being diverted, but you don’t know though which country, then check your IP address at IPLocation.net. Generally, if you want to play an oline game, you are better off sticking with the Cruise Control server. 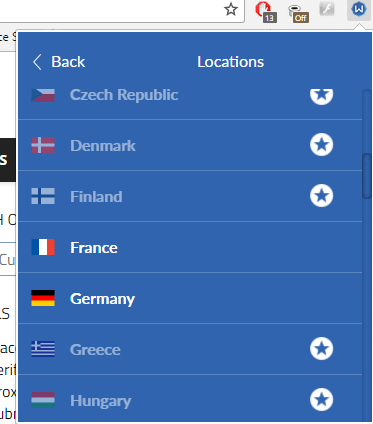 However, if you need to get into a media site, you have to be sure of which country you appear to be in. Click on the connection locaction to get a drop-down list of server options. When you are on the free version of the service, you will notice that it blocks out many locations. Controls are available on the settings menu, which you access off the hamburger menu in the top left of the interface. 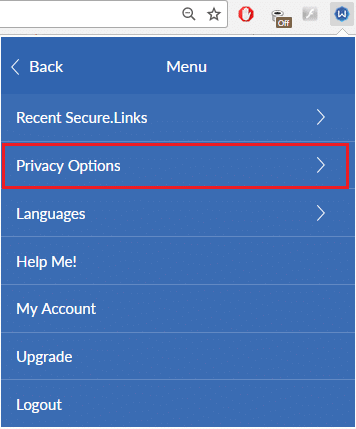 Explore the “Privacy Options” to customize your VPN. 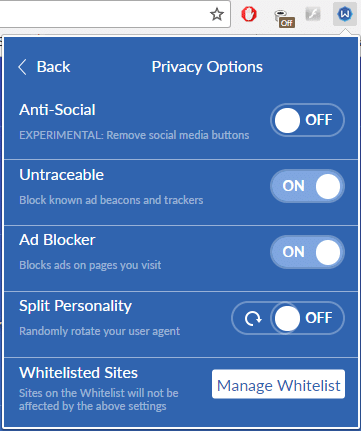 This is where you can access the Windscribe extra privacy features, including the ad blocker, the tracker blocker, and the Split Personality feature. If you “whitelist” a site, then the security measures that you specify in this settings page will not be applied to that site. The Secure.Link function is available at the main screen of the browser extension interface. You just need to click on the “Copy Secure.Link” button to get a link for the webpage that is currently open in your browser. You can send that link on to someone else, or paste it into a browser to see the link information yourself. The generated link presents a summary of the security risks and trackers that were detected in the page. 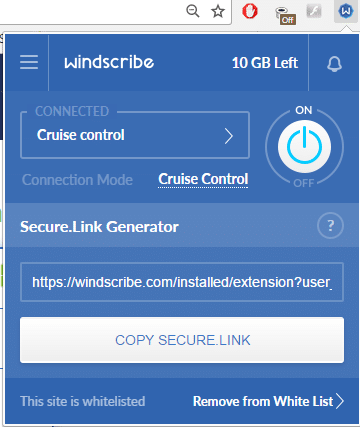 When you click on the “Continue Protected” option, Windscribe will take you to the original page, but with all trackers disabled. If you send this link to a friend, they will receive the same service, including the tracker killer, even if that person doesn’t use Windscribe. Windscribe defines its browser extension as “VPN Lite,” which implies that the security applied in that service is not as strong as the privacy created by the VPN implementation in the Windscribe app. 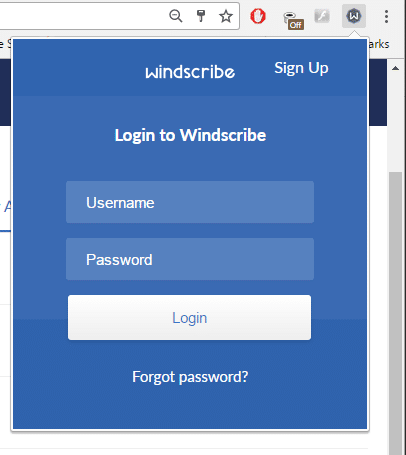 Open the Windscribe app by clicking on the program’s icon on your desktop. You have to sign in the first time you use the app, even if you are already signed in to the browser extension. Enter the username and password that you set up when you signed up for an account. The app is small and will open with the VPN turned off. In the illustration below, you will see that both the app and the browser extension are running. Each is connected to a separate server. This creates a “double hop” VPN, which the broswer extension detects and flags with a message. In this instance, the app is connected to a server in the US, and the browser extension is connected to a server in the UK. The IPLocation.net site reported my location as being in the UK. When I turned off the browser VPN, IPLocation reported my location as the US. I then switched the browser extension server to Canada West and turned the VPN on again, creating another double hop connection. IPLocation reported my IP address as being in Canada. This shows that the user’s identity is dictated by the server location of the browser extension when you engage the VPNs of both the app and the extension. This feature was a little difficult to get working. If both VPNs are turned on, the default state is that control is assumed by the app version, so it is impossible to change the browser server location to get the double hop function to kick in. It took several tries of turning each on and off again before the app override gave way to a double hop VPN configuration. The browser extension has a lot more utilities than the app. However, the company recommends that you install both. The encryption protection is stronger in the app than in the browser version. Also, the browser version ignores a lot of the other activity that might be going on with background connections made by processes running on your computer outside the browser. The support system is available throughthe website. The site’s top menu bar includes a Support button, which gives access to the helpdesk. The FAQ section doesn’t contain much information. Other VPNs invest a lot in creating a knowledge base, which answers user questions without recourse to support staff. I wanted to know about the Split Personality feature of the browser extension. The FAQ section didn’t explain this. You access the support desk by clicking on the “Submit Ticket” button. Users ask their questions via a standard webform. All replies are via email. You will receive an autoresponse email as soon as you submit your query. I got an answer to my question a little over half an hour after I submitted the query. A major reason to install a VPN is to get around the regional restrictions on media streaming sites. However, you don’t want the functions of the VPN to slow down your connection to a point where the entertainment is unwatchable. These speed tests on the Windscribe VPN service were preformed from a Caribbean nation, using Speedtest.net. I tried both the app and the browser extension to see whether they could get me around the regional restrictions on media sites in the US and UK. In all tests, the app and the browser extension had exactly the same results. In the US, both versions of the VPN got me in to watch shows on the NBC website. However, neither could get me in to ABC or Netflix. In the UK, both versions of the VPN failed to get past the Netflix proxy detection system. However, both enabled me to watch shows on BBC iPlayer and the Channel 4 website. 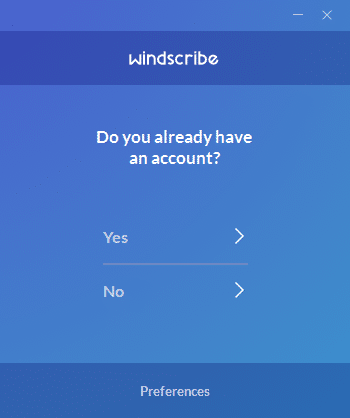 Should I Subscribe to Windscribe? The free version of Windscribe is great for ensuring privacy on the internet. The company’s commitment to privacy and its creation of a wide range of free tools is really impressive. However, the speeds that the app achieves are not so hot. There’s also the possibility that the much faster browser extension isn’t applying the same level of encryption. Both the app and the browser extension installed effortlessly and are very easy to use. The double hop feature is fun to use, but may slow down your connection to the point that interactive service become unusable. If you want to get into streaming services, perhaps you should look for another service. 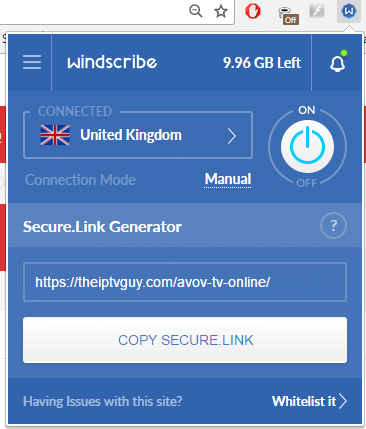 One benefit of Windscribe’s free service is that you could keep it installed for non-streaming activities, but find a different service to get you into Netflix or ABC.